The whole en papillote thing has never really worked for me. Which is not to say that I don’t like foods cooked with this method, but that foods which I try to cook using this method, never actually seem to cook. I can’t tell you how many times I have removed half raw foods from my oven and just wanted to give up. But after much trial and more error, I have determined that it is not en papillote which is my problem, but rather, en aluminum foil. Some combination of an oven which is too weak and foil which is too strong has caused me much anguish. But not this time! No, I’ve learned my lesson. So even though this week’s French Fridays with Dorie recipe, Brown-Sugar Squash & Brussels Sprouts en Papillote called for the use of aluminum foil, I used parchment paper. And not to get all pedantic but, isn’t that what en papillote means to begin with? Anywho, setting that little rant aside for now, this week Dorie has us chopping up brussels sprouts & squash, wrapping them up in neat little packages, and roasting them in the oven. 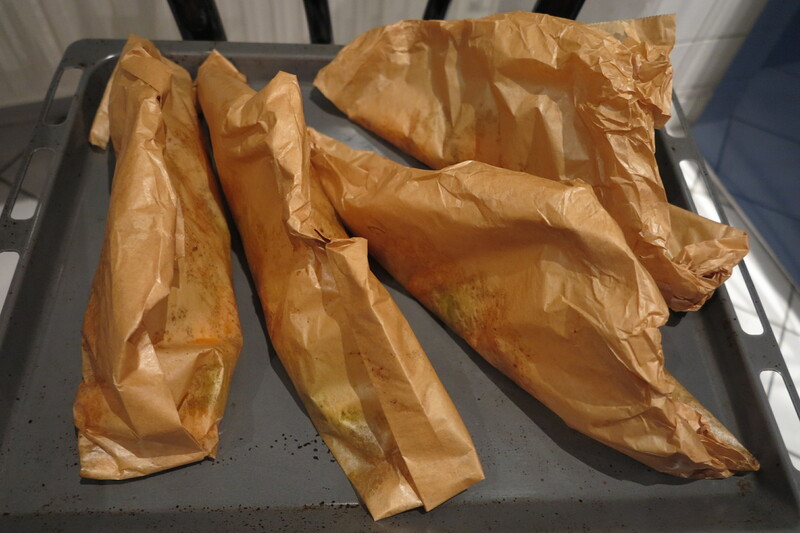 I’ll admit that I was mighty tempted to leave the papillote out all together and just roast those darn veggies. But then, it wouldn’t have really been a new recipe, because roasted squash or brussels sprouts (though admittedly not usually together) is one of our pretty standard sides. So en parchment paper it was and both my husband and I agreed that it was pretty darn tasty. Better than simple oven roasted? No. But a nice alternative which I can see us using again. This entry was posted in french fridays with dorie and tagged Around my French Table, seasonal - autumn, seasonal - winter, side dish, technique. Bookmark the permalink. I’m not a huge fan of the method either. MUCH prefer roasted veggies!!! I also prefer roasted veggies, however I really enjoyed this one! Your dinner looks delicious! Happy Friday! Yep. That what I love most about our group – learning new things (although, not all of them – LOL!). Have a wonderful weekend! Rose, well, we both used unbleached parchment paper and I am sure that´s what “en papillote” is all about. Your veggies look wonderful and healthy! Have a great weekend (hopefully the rain is going to stop sometime soon)! I’m not a fan of this method either, occasionally I’ve had a delicate fish come out good this way but nothing else. You’re a sport for trying: I roasted. The vegetables look great. I have never tried that method of cooking, but someday I must. Brussel Sprouts rock and any way to cook them is great with me. Delicious looking dinner:) Next time, I will try parchment for my papillote. Have a great weekend. ha! my husband said the same thing about “en papillote” and wouldn’t leave me alone until I admitted he was right. 😉 I figured he’d be used to me doing as Dorie says by now! 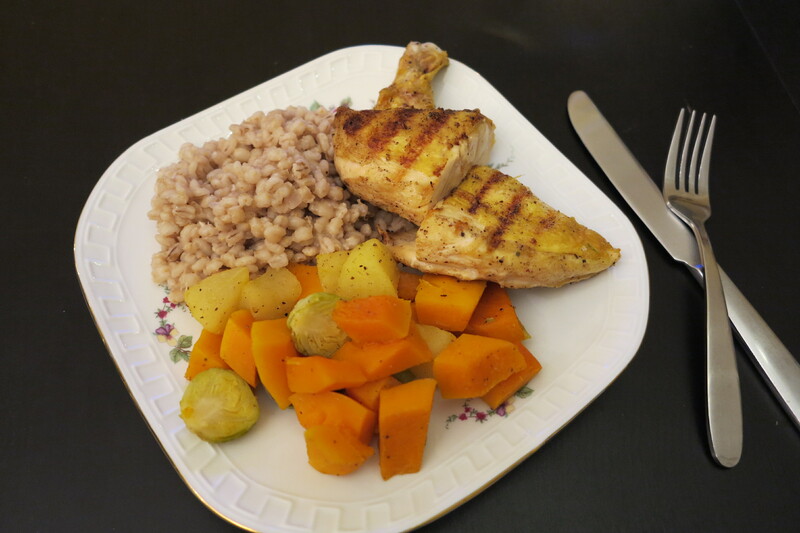 This was a nice change from roasted veggies, and it’s definitely something I would do when I want to minimize the mess. It certainly makes for a healthy-looking dish – yours looks great! instead of tin foil. Your veggies look great and so delicious. The great thing about the wrapping is the reduced mess to clean up! I like these veggies roasted better too, but this was nice for a change. There are so many variations of this to try. You’re right about en papillote. I’m not sure why Dorie doesn’t recommend parchment instead of foil. The pouches were fun for a change and since we could cook outside they were a good idea, but…I’d rather use parchment. Your meal looks wonderful…it’s fun to see how everyone used these veges. I roast a lot of vegetables during the winter months, so this was a welcome alternative. I’m glad it worked out for you. Glad you enjoyed, too! I was surprised that Dorie used foil in this recipe instead of parchment. 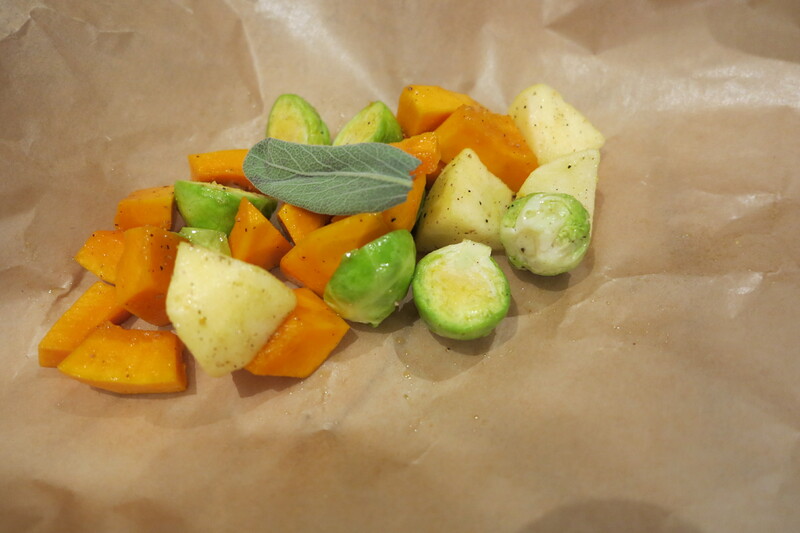 I went the roasted route but I do like en papillote for some foods, not brussels sprouts, and especially on the grill. I loved this fruit and veggie combo. Yours looks great. Roasted is better, but this was a nice change. I like that you got literal with the en papillote and had success! I agree. They need a new name for wrappiing in foil. Papilotte is NOT metal. When was foil invented anyway? Everything looks really good but I agree that roasted would be good as well! I am happy to hear the parchment paper worked for you. Your whole meal looks quite tasty!